These shiny, chrome-plated brass circular needles are cuboid-shaped, making them ergonomically advantageous for knitters in search of better grip AND more uniform stitch definition! 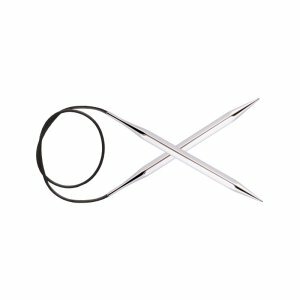 These features, in combination with perfectly tapered tips, smooth joins, and flexible cables, result in circular needles perfect for any project! You may enjoy taking a look at the Universal Yarn Bamboo Pop Spearmint Shawl, Lorna's Laces Shepherd Sock On the Spice Market Shawl, Anzula Squishy Imagine When Shawl, and Rowan Fine Lace Tillicum Shawl kits all using Knitter's Pride Nova Cubics Platina Fixed Circular Needles.